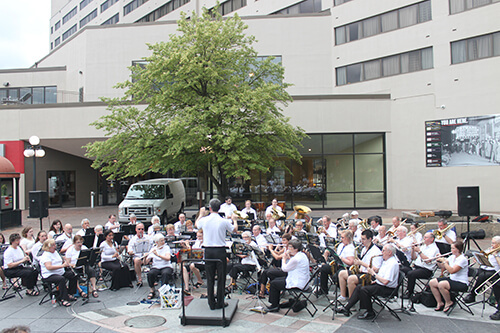 The Iowa City Community Band is a volunteer organization, approved and sanctioned by the city of Iowa City. Our concerts in Iowa City and Coralville parks during June and July include a mixture of marches, music from Broadway musicals, and old favorites and sometimes feature a guest soloist. Concerts are either in the afternoon on Sunday or early evening during the week – select the “Concerts” tab above for current dates, times, and locations. The band also plays concerts at various venues in the Iowa City area, including Arts Fest in downtown Iowa City, Ice Cream Social in Upper City Park in Iowa City, Coralville Thursday Night Concert Series, and Coralville’s Fourth of July Celebration. We have also performed at events in area towns such as North Liberty Fun Days and West Branch Friday Night Concert Series. The ICCB also presents a winter holiday concert in the Englert Theatre in downtown Iowa City .Members of the ICCB come from all walks of life in the Iowa City area, ranging from high school students through retirees. Our conductor is Rob Medd, Director of Music, Iowa City West High. The ICCB has performed continuously since 1982. Our concerts are free to the public.